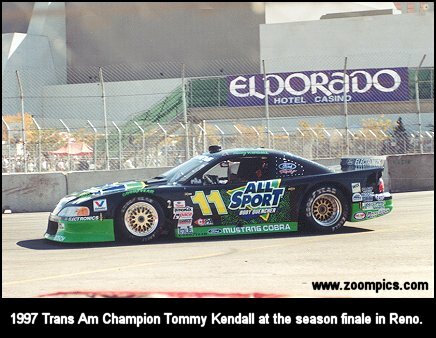 If you wanted to be a contender in the 1997 Trans Am Championship your weapon of choice better have been a Mustang. After all the statistics had been collected at the end of the season it was obvious that Ford was the dominant manufacturer. Mustang drivers captured all the poles, wins and all but two of the fastest race laps. Ford easily took the Manufacturers' Championship with 13 wins in 13 races. But the biggest story of the year was the Roush Racing's Tom Kendall. 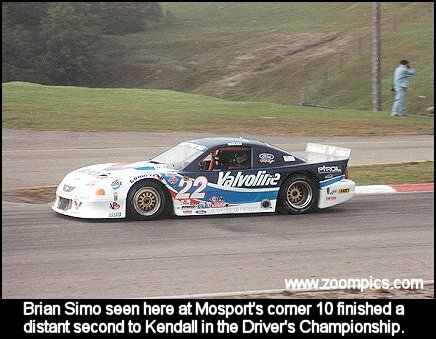 He set many records during the 1997 Trans Am season but the most impressive were his 11-straight race wins. Trans Am rules required a purpose-built tube frame chassis. The bodies were made of composites, such as carbon-fiber, Kevlar and fiberglass. The rules stipulated that the cars should maintain the recognizable external features of the manufacturer's model while providing flares necessary to keep the tires inside the bodywork. SCCA Pro Racing used body templates to ensure the shape of cars were within designated tolerances. Cars were required to use the stock windshield or an approved alternative, which had to be mounted in the original location and at the original angle. The rules also dictated the use of the stock taillights, which were often the only production parts on the cars. The standard wheelbase for a 1997 Trans Am car was 102-inches. However, a grandfather rule applied to cars registered prior to 1995 allowing them to compete with stock wheelbase specifications that could be no greater than 110-inches. Overall car width was restricted to 80-inches. All four wheels were required to be the same diameter (15 or 16-inches) with a maximum rim width of 12-inches. Only bias-ply racing slicks or rain-tires were allowed. The maximum mounted cross section width of these tires was 14.75-inches. The rules also required a minimum ride height was 2.5-inches. A muffler was mandated that would restrict a car's sound level to 107dba. The minimum weight of the cars was based on a combination of engine displacement and configuration. For example, a 275-cubic inch V6 engine, the smallest eligible motor for the series, would be required to weigh 2,550-pounds. At the other end of the spectrum, Trans Am rules allowed for the use of a 358-cubic inch V8 motor, however, the car would have to weigh 2,725-pounds. The popular choice among teams was a 311-cubic inch V8 engine which required a car to weigh 2,600-pounds. This combination of rules would allow a Trans Am car to accelerate to 140-miles per hour in approximately 11.5-seconds. Speeds up to 200-miles per hour could be reached depending on the gear ratios in the transmission and final drive. Equally impressive was the stopping ability of a Trans Am car, which could go from 70-miles per hour to a complete stop in 131-feet. Another remarkable aspect of these cars is the handling, which despite their weight and size could pull over 1.3Gs. Roush Racing constructed Tom Kendall's 1997 championship winning car. Roush chose to use a 310-cubic inch V8 pushrod motor. The engine was a cast-iron block with aluminum cylinder heads. It was estimated that this combination produced about 650- horsepower at 8,200-rpm. The 1997 rules required the use of a spec rev limiter, which was set to 8,200-rpm. The minimum weight for a car using a 310-cubic inch engine was 2,600-pounds but after the driver and fuel were added that total would be closer to 2,800-pounds. As a point of comparison, the 1997 production version of the Mustang Cobra was equipped with a 4.6-liter DOHC engine, which produced 300-horsepower and weighed 3,084-pounds. The power in the Roush car was transferred to the rear wheels through a 5-speed Hewland transmission and 9-inch Ford differential. Kendall and the Roush Racing team began their streak at the opening race of the season. In 1997, the series started in February at the St. Petersburg street course where Kendall had to come back from a spin to take the victory. 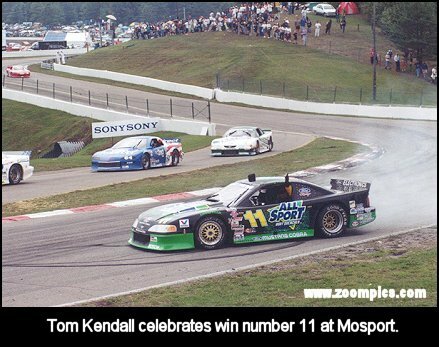 Kendall's next win was at Phoenix, which was followed by victories at Lime Rock, Detroit, Mid-Ohio and Minnesota. Throughout the season, Kendall and the Roush Mustang set new records. His seventh win of the 1997 series at Cleveland put his career earnings over $1 million and in doing so he became the first Trans Am driver to reach this milestone. By the end of August, he had taken wins at Trois Rivieres, Watkins Glen, Road America and Mosport. Kendall's ninth straight victory, which was at Watkins Glen, surpassed the previous record of eight consecutive Trans Am wins set by the late Mark Donohue in 1968. In an ironic twist it was Jerry Titus who ended Donohue's streak and as a result of his accomplishments during the year, Kendall won the Jerry Titus Award - voted on by the American Auto Racing Writers and Broadcasters Association to recognize the driver of the year. The victory at Road America allowed him to clinch the 1997 Driver's Championship. This was his third consecutive title and fourth of his career making him the first driver in series history to achieve these milestones. Kendall's streak came to an end at Pikes Peak the twelfth race of the season. The winner was another Mustang driver and rookie sensation Mike Borkowski. 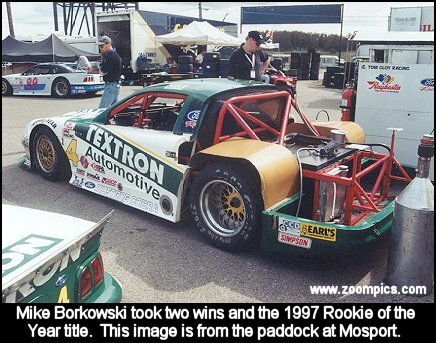 Borkowski was Bobby Rahal's protégé whose experience was mainly in sports racing and open wheel cars but he seemed to come grips with the bigger and heavier Trans Am cars by the end of the season. At Pikes Peak, the Tom Gloy driver qualified fifth but the series rules determined the starting order using a draw. This process was restricted to the five fastest qualifiers and Borkowski drew number one allowing him to start from the pole. This proved to be the most exciting Trans Am event of the season as Kendall and Borkowski bumped and banged each other during the final laps. Despite all this pressure from the new champion Borkowski was able to prevail. Three weeks later he would take a win at the crashed filled finale in Reno. These wins and other top ten finishes allowed Borkowski to take the rookie title and third in the final standings. 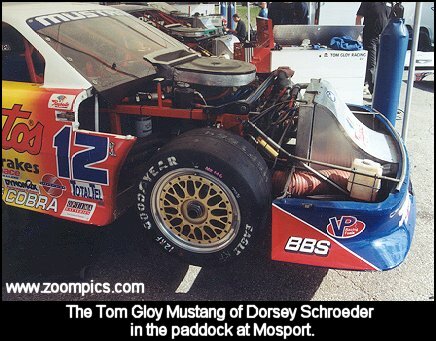 Other top Mustang drivers included Brian Simo, Dorsey Schroeder, Jon Gooding and Michael Lewis. Simo and Schroeder were members of the Tom Gloy Racing team. 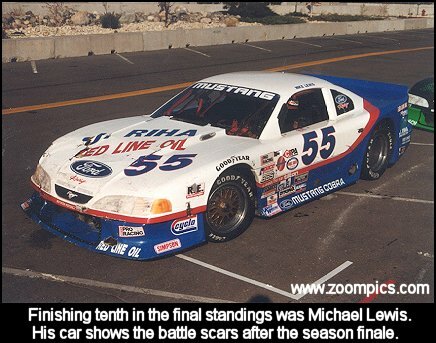 Schroeder the 1989 Trans Am champion had a frustrating season. Although he had several top three finishes and was the fastest qualifier twice he could only manage a fifth in the final driver standings. Simo's consistency paid off and he finished second in the championship just one point ahead of Borkowski. Finishing fourth in the final standings was Kendall's Roush teammate Jon Gooding. Rounding out the top ten was Michael Lewis and his team. The wins by Kendall and Borkowski and the contributions of the other Mustang drivers earned Ford its seventh Manufacturers Championship. Although Ford and Kendall set some impressive records it must be remembered that Chevrolet had withdrawn factory support at the end of the previous year, however, General Motors was well represented by teams that included drivers such as past champion Greg Pickett and future series title holder Paul Gentilozzi. 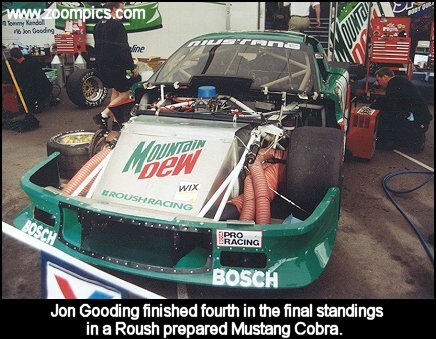 While the Roush Mustang allowed Kendall to make history over the course of the 1997 season certainly one of the greatest contributions of this combination was catching the attention of fans and the media, which ultimately increased the profile of the Trans Am series.